India is blessed by the fact that the Buddhism was founded here in 5th century BC. Tibetan Buddhism is thriving in every corner of India due to its close proximity to the Tibetan border. The mighty Buddhist monasteries of Himachal Pradesh make everyone forget their stress, anxiety, and one is simply lost in the world of divinity that has just about everything. Himachal Pradesh is home to the most beautiful, pious and chronicle monasteries which can enchant anyone with their exquisiteness. The monasteries are the place where tourist can spend a day in salvation or can light a butter lamp for their inner peace. These are places where one can find enlightenment. Himachal Pradesh is considered as the abode of the 14th Dalai Lama (religious name: Tenzin Gyatso), and was acknowledged as the place where the Guru Padmasambhava, known by the name of "Guru Rinpoche" and the "Second Buddha", preached Buddhism. Other then monasteries, there are many educational institutes and libraries which display Tibetan work and archives. Tibetan Buddhists have successfully preserved the charm, language, culture and elegance of Buddhism in India. The Tabo monastery in Spiti Valley should be on the top of every tourist bucket list on their spiritual tour to Himachal Pradesh. Being the oldest surviving monastery of Himachal Pradesh, Tabo monastery has been carrying the rich Buddhist legacy since 996 AD. The monastery houses nine temples, four decorated Stupas, and cave shrines. Each and every wall of the Tabo monastery is decorated with carved walls, beautiful frescos, priceless collections of thankas (scroll paintings), manuscripts, and well-preserved statues. The monastery was restored in 1975 after it was hit by a huge tremor which almost damaged the architecture. The site is currently protected by the Archaeological Survey of India. The monastery is at its best during the Chakhar Festival, which is dedicated to the peace and happiness of all. According to His Holiness the Dalai Lama, "The most important is Tabo, noted for its exquisite quality of paintings and stucco images that adorn its walls. These works of art delightfully express the vigour of the spread of Buddhism from India to Tibet and the dynamic mingling of cultures". The Tsuglagkhang monastery in McLeod Ganj is placed against the large rocks of Himalaya. Considered as a home to the 14th Dalai Lama, Tenzin Gyatso, the monastery is the main tourist attraction of McLeod Ganj as well as a pilgrimage site for Tibetan exiles. The simple life of Dalai Lama can be closely observed in this monastery. Within the monastery are the Photang (Dalai Lama's residence), Tibet Museum, Tsuglagkhang Temple, and Namgyal Gompa. The pleasant walking trail around Tsuglagkhang is peaceful, has excellent views, and passes along a beautiful temple strewn with prayer flags. There are some monasteries in Himachal that are equally popular in showcasing the ideas of Buddhist culture and its architecture. One can see the influence of Chinese architecture in the Kye Monastery. 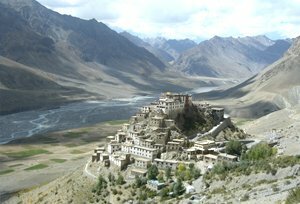 The monastery is one of the oldest in the Spiti valley. Here, the visitors can see the ancient Buddhist paintings, Holy Scriptures and ancient books. Another important monastery in Himachal Pradesh is the Namgyal Monastery which is one of the major institutes for Buddhist teachings. 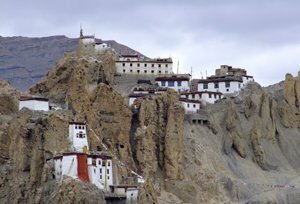 The monastery was founded by the third Dalai Lama; hence it is regarded as the holiest monastery in India as well as in the entire world. Built in the 8th century, Gondola monastery is one of the most beautiful monasteries in Himachal Pradesh. 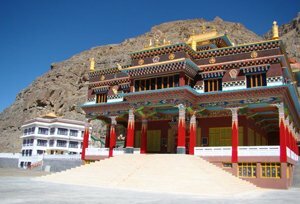 The monastery was founded by Guru Rinpoche or Padmasambhava. Bir Monastery (Mandi), Dhankar monastery (Spiti), Kaza monastery (Spiti), Tayul Gompa (Valley of Lahul and Spiti), Guru Ghantal monastery (Lahaul), Sissu monastery (Lahaul), Kardang monastery (Lahaul), and Shashur monastery (Lahaul) are some of the best monasteries which one should see on their trip to Himachal Pradesh. These monasteries are the most revered of them all. A journey to these sacred monasteries of Himachal Pradesh is simply mesmerizing. Every year, people from every nook and corner of the world visit these enchanting yet historical monasteries in search of inner peace. These are the places which depict the life, sayings, preaching and teachings of Buddha.